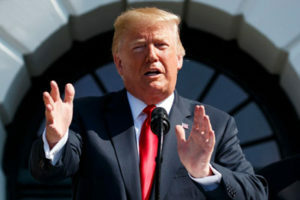 WASHINGTON — Democrats in Congress called on President Trump Tuesday to stop the public release this week of a blueprint that contains instructions on how to build plastic guns with a 3D printer. The Trump administration had decided in June that the public release of instructions to build the guns, which are compiled by Austin, Texas resident Cody Wilson, would not violate a federal law; on Friday, the government said that Wilson wouldn’t break the law if he posted the instructions online. Wilson’s website had said that the downloads of the blueprint would be released Wednesday, though he actually began making them available last weekend. “Where the heck has he been?” he asked. Democratic lawmakers said Trump would need to do more than express skepticism if he opposed the release — he would have to formally reverse his administration’s decision in order to halt the further publication of the blueprint. “We need Donald Trump to reverse his administration’s decision, and to do it now,” said, Sen. Ed Markey, D-Mass. Under the Obama administration, the State Department had sued Wilson and blocked him from posting his instructions online, but the department under Trump dropped the lawsuit. Though the department had initially said his blueprint would violate the arms export law, it reversed course in June. As the federal government considers whether to change the rules around the law, they made an exception to the rule last week, allowing Wilson to begin posting his material online. Secretary of State Mike Pompeo, questioned by Democrats about the situation last week during testimony before the Senate Foreign Relations Committee, said that he would look into the matter, but lawmakers said Tuesday they had not yet received a response from him. Sen. Bill Nelson, D-Fla., whose state has been affected by gun violence in recent years with the Pulse nightclub shooting and the Parkland school shooting in February, is filing legislation Tuesday to block the release of Wilson’s plans. He noted at the press conference that a number of lawmakers had already filed legislation that would require any guns that are made to contain a metal part for detection purposes, and to carry a serial number. 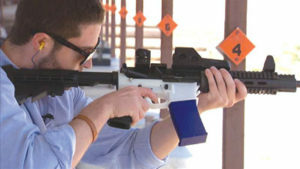 In the House, which is on recess until September, Rep. Seth Moulton, D-Mass., tweeted Tuesday that he’s introducing a measure to ban 3D printed guns. More than 1,000 people have already downloaded the 3D plans for AR-15 semi-automatic assault rifles, according to Pennsylvania Attorney General Josh Shapiro. A number of states, including Pennsylvania, have joined in preparing a lawsuit to file in federal court to block Wilson’s website from making the instructions available online and attorneys general from 20 states wrote to Pompeo and Attorney General Jeff Sessions Monday urging them to revoke permission for the downloads.